I never canned anything in my life until 2 years ago. A local friend that lives in a 100-year-old farmhouse has a huge, old apricot tree and offered us some. That apricot jam has been one of my favorite things I’ve ever canned. Especially, in the dead of winter (with 2 feet of snow on the ground), warm toast with apricot jam is pretty delightful. I made some with less sugar than others (and a few with no sugar), and I sure wish I’d written down what I did, so I could repeat the successes and skip the ones that turned out a little TOO runny. 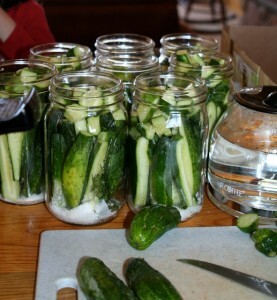 Last summer, another friend (who’s husband is a gardening genius, but that’s another story) harvested come cucumbers and made dill pickles one weekend. On Monday morning, she recounted the canning adventure at the office, and I guess I must have been a little too-obviously green with envy, because, by the end of the week, she showed up with a huge bag of cucumbers, fresh dill from her garden (!!) and a recipe for pickles. I brought those home to my family, and my oldest daughter (a dill pickle aficionado) helped make a dozen or so jars of pickles. She was delighted to learn “where pickles come from” and also why ours aren’t fluorescent like the ones in the store (no yellow #5 added). We made some jam last summer as well, which we enjoy all year with our fresh-baked bread. Near the end of the summer, I broke down and bought a pressure canner. I bought a case of tomatoes locally, and set to canning them. Two weeks later, I bought another case, and canned those too. I experimented with plain tomatoes, a salsa recipe I found online, and a spaghetti sauce recipe. The spaghetti sauce (although a little plain) has been the most useful, for pasta dishes and homemade pizza. The salsa recipe, despite the high number of rave reviews, was just not to our liking. And, the plain tomatoes are okay, but I overestimated my use of plain tomatoes. It takes advance planning to incorporate them into something, and that’s not always my strength. We haven’t canned anything yet this summer, but I’m optimistic for August and September. The end of July in the high country has not yielded good tomatoes (in bulk) yet. I’m not as close with the apricot friend this year, so we may or may not hear from her when her fruit is ripe. The way I see it, the more self-sufficient we are, the less resources we consume. And, being in a fairly remote location, we try to keep our pantry stocked in case of emergency. Now if I could just GROW the tomatoes we need for canning, I’d be a whole lot better off! ← Shrugging: efforts in frugality.